I can’t find a free article on this, I’ll look more later; maybe jstor has one. From the abstracts that I have seen, it appears that there is consensus that plants have a lot of convergent evolution going on. Does this explain why there are herbs and woody in most plant families? I was trying to figure out how both trees and herbs seem to evolve from one family to another. I’m thinking that it is the herbs that evolve and then some of those go woody. The Asteraceae is considered the most evolved (or derived) and it has very few woody members so my thought process seems like it might have merit. Or maybe I’m completely confused. If so, can someone please explain to me how the dandelion in my back yard has more evolutionary history behind it than a Magnolia tree? From the abstracts that I have seen, it appears that there is consensus that plants have a lot of convergent evolution going on. That seems right to me, and unsurprising as well. I was trying to figure out how both trees and herbs seem to evolve from one family to another. I’m thinking that it is the herbs that evolve and then some of those go woody. Perhaps you mean that the herbs come first. I don’t know the answer to that. They both have exactly the same amount of evolutionary history behind them. Thanks for bringing this up. Botanical evolution will be great to read. Yes, that is what I mean. I don’t see how you could have both herbs and trees in an family without them having a common ancestor so either one tree or the herb from the ancestral family must be the common ancestor. I can’t see trees being the common ancestor, it must be the herb. Most Gymnosperms (ancestor to Angiosperms) are trees or shrubs. Most Asteraceae (most derived Angiosperms) are herbs. I am wondering if you start at the bottom of the clade chart with plants that produce seeds; whether this is a continuous trend. The more derived, the fewer trees. The bottom line is that it appears that most plants with seeds tend to either evolve or go woody. It seems a definite pattern. Well OK, maybe not that simple. Maybe “pattern” is wrong; I’m not sure that it is wrong though. Thanks for the link. I’ll check it out. I also have email into my Botany professor. Sorry if I’m not making my thought process clear. I don’t follow your reasoning. If you are proposing that woodiness can only be gained but can’t be lost, you should provide a rationale. It might be right for all I know but I don’t see why it has to be. The bottom line is that it appears that most plants tend to either evolve or go woody. I can’t think of a correct use of the word ‘evolve’ in which this sentence makes sense. I wish you would not use ‘evolve’ to mean ‘change’. Derived then. I’m just not used to using that word. If you are proposing that woodiness can only be gained but can’t be lost, you should provide a rationale. It might be right for all I know but I don’t see why it has to be. If trees were the ancestral form, I would think that the more derived forms would be trees not herbs. I’m trying to wrap my head around it so hopefully we’ll both learn something! I have an email into my Botany professor. I think he’s a Christian. I’m not sure you have matters well defined yet. Even e coli bacteria have millions years of evolution behind them… just as snakes do, or amoebas. Some life forms seem more complicated… but have had to battle might fiercely to retain their place in the cosmos of ecosystems. Crocodiles are said to have changed little since the time of the dinosaurs… but even this is a terrible exaggeration… for we can easily imagine quite a bit of biochemistry changing within the cells of these crocks… changing, changing, and more changing… over all the millenia! I’m not sure what you are trying to say here. Are you suggesting that I have my plant clade chart wrong? 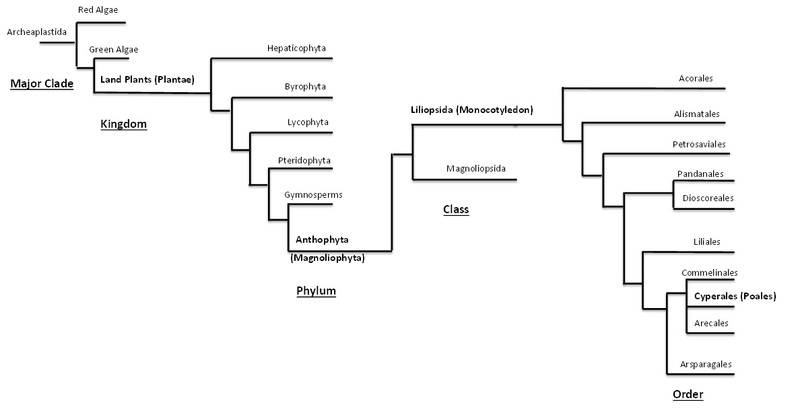 Here it is: Plant Clade, starting with the Gymnosperms there are both trees (woody) and herbaceous plants in each class. So how did this happen? For instance, from Gymnosperm to Magnoliophyta-what was the ancestor? Herb or woody? Again, all along down the line from Acorales to Arsparagales what was the ancestral form from the previous Order? Yes, I understand that even simple organisms undergo change. Sorry that I used the wording of “Evolutionary history”. My question remains. How did it get to be that every derived class of descendants of Gymnosperms have both woody and herbaceous members? Even if woody can evolve into herb (I find that incredibly doubtful) but even if; so what? In each class one ancestor created both. Isn’t that very different that what we see in the animal kingdom? It’s either one form evolving into each forms (woody and herb) every single time or one of each form evolving in the same way as to be classified in the same order. No matter how it’s happening; it;s really strange! Don’t you think? Yes, I would have to agree… it is compellingly mysterious. In a planet full of marauding plant eaters… perhaps there is a strong survival factor in not being so easily “ate-up”? There are also benefits for being small and requiring less resources. Yes, that is why each type has representatives of each form… no matter what the design, there is a niche that favors one over the other, and there are niches all over the planet! That means though, that plants must inherently be more flexible. I mean, we don’t see that drastic of change in animals within the same families. Plants do seem more flexible. By doubling chromosome count, some plants create brand new species in a single generation. We really should spend more time discussing exemplars of plant evolution! Cellulose, the “super-putty” of plant forms, is capable of great diversity of configuration. We really should spend more time discussing exemplars of plant evolution! Especially this time of year when I try to decide which tomato varieties to put in the garden.